Missouri has launched a website to help Missourians be prepared for tornadoes and severe storms. This website includes videos on sheltering and storm warning systems; http://stormaware.mo.gov. also includes links to severe weather texting services to alert Missourians to severe weather in their area. The Missouri StormAware website shows how people can find the safest place to shelter in their house and the steps mobile home residents should take as soon as they move in to their residences. There’s also information for sheltering in schools, places of worship and other large gathering places. A video on tornado sirens and how they are used explains that they are designed to alert only people who are outdoors, and should not be relied upon while indoors. In another video, a National Weather Service meteorologist explains the importance of weather alert radios and recommends that every Missouri family have one in their home. An important feature of the StormAware site allows users to find text messaging services in their area that will allow them to get automatic text alerts whenever a severe storm warning is issued in their area. The services, which are not provided by the state of Missouri, are free, but normal text messaging rates will apply. “We will also be adding additional content and we hope that Missourians will visit, sign up for text messaging alerts in their area, refer friends and relatives to the site and then check back periodically to learn more about being StormAware,” Parmenter said. 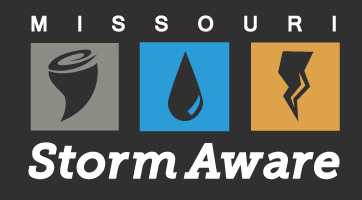 To explore Missouri StormAware and get helpful preparedness tips for your family, visit http://stormaware.mo.gov. This entry was posted in Happenings Around Town by admin. Bookmark the permalink.